In principle, a new BC statute that deals with climate change accountability sounds like a good thing. But while Bill 34, introduced last week, will rename a key climate law the “Climate Change Accountability Act,” the Bill does little to make anyone more accountable for fighting climate change. The Bill does include some welcome new targets, as well as other positive amendments. However, the lack of accountability is a problem, because the province – notwithstanding some notable moments of climate leadership – has not always followed through on its commitments to reduce greenhouse gas (GHG) emissions. This government will firmly establish British Columbia standards for action on climate change. It will aim to reduce B.C.’s greenhouse gas emissions by at least 33 per cent below current levels by 2020. This will place British Columbia’s greenhouse gas emissions at 10 per cent under 1990 levels by 2020. It is an aggressive target and will set a new standard. To achieve that goal we will need to be focused and relentless in its pursuit. A keystone of the government’s plan was the enactment of the Greenhouse Gas Reduction Targets Act (the “Act”), which set targets for the province for reducing greenhouse gases: the 2020 target (30%) promised in the Throne Speech, as well as a 2050 target of 80% reduction below 2007 emission levels. The Act required the government to report every two years on its progress towards achieving the targets, but government officials retained the sole discretion about what exactly to report. Unfortunately, BC “lost focus” and the government’s biennial reports have not lived up to the intent of the Act – they describe steps that either are being taken or are planned, but don’t discuss whether those steps are sufficient to achieve the targets. And since the Act did not provide for any independent monitoring or scientific review of those reports, the public largely accepted the government’s word that its planned actions were enough. So, disappointingly (but not surprisingly), while an interim 2012 goal was achieved, a lack of climate leadership from the province in recent years has meant that it has become all but impossible to achieve the 2020 goal. The government recently released figures showing that the province’s 2015 GHG emissions were only 2.1% lower than 2007, and rising. A 2040 target of 60% less than 2007 levels. Abandoning the 2020 target is disappointing – but understandable given the inaction and rising emissions of recent years. The new targets, if achieved, will get us back on track to meeting our 2050 target. Unfortunately, Bill 34 does nothing to address the shortcomings of the original Act. It does not require government plans to be practical or realistic. It does not provide for monitoring and science-based review of the government’s plans and actions. In short, Bill 34, while renaming the Act the Climate Change Accountability Act, does nothing to address the original Act’s lack of accountability. It allows the Minister of Environment to set sectoral greenhouse gas reduction targets. By specifying which sectors will be expected to reduce their emissions by how much, the government could provide more direction to both its own staff and to specific industries. In 2015 the BC Climate Leadership Team, appointed by the government, recommended a target of 30% below 2015 levels by 2030 for both the Transportation and Industrial Sectors, and a 50% target for the Built Environment (community design, buildings and waste). It requires the province to prepare, every two years, a plan of how the province will adapt to climate change impacts (adaptation planning). This is presumably in response to recent (deserved) criticism from the Auditor General, Carol Bellringer, that the province has not done enough adaptation planning. Both of these developments are worth applauding. In particular, a credible adaptation plan for the province may allow us to begin understanding just how much climate change is already costing the province and to begin to get a handle on preventing the worst of those impacts. Nonetheless, we would like to have seen a Climate Change Accountability Act that lives up to the full promise of its name (as discussed below). The government’s press release on Bill 34 makes some claims that seem grandiose, given the relatively modest changes to the Act proposed. The environmental community, however, has seen government after government set greenhouse gas reduction targets which they then fail to meet. So most environmental groups have had a mixed response to Bill 34 – applauding new targets, but also calling for more accountability to ensure those targets are met. If the Government of British Columbia truly wants to get the province ‘back on track’ and regain credibility on climate it will need to do more than simply introduce targets. 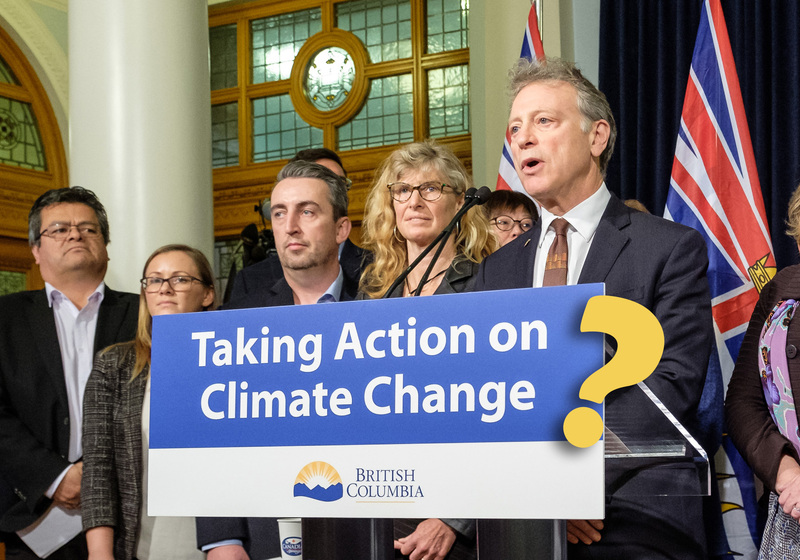 B.C.’s climate laws need a complete overhaul to ensure that politicians and industry are accountable for taking action that delivers real progress in tackling climate change. We’re so accustomed to governments missing their climate targets in Canada that it can be difficult to think what a law that held them accountable might look like. Not so in some other countries, such as the UK where the Climate Change Act, 2008 has guided the country in setting a series of carbon budgets that have seen its GHG emissions drop, in 2016, to 43% below 1990 levels. Carbon budgets are expressed in terms of how much greenhouse gas pollution can be emitted in the near future over a one- to five-year period (depending on the system). They tell us what we should be doing now if we intend to achieve our long-term targets. Simply setting a long-term target and expressing it in terms of a percentage reduction is not so useful for short-term planning. BC’s (and Canada’s) failure to meet its greenhouse gas reduction targets demonstrates that politicians and governments cannot be trusted to monitor and judge their own strategies to reduce greenhouse gases. Instead – similar to a financial budget – a carbon budget model appoints an independent auditor to give advice and to measure whether targets are actually being achieved. In the UK this is done by an expert committee, and a BC Climate Change Accountability Act could certainly create a similar specialized committee. However, BC might also choose to ask the province’s Auditor General or a similar officer to take on the job. The important thing is having an office with either scientific knowledge or the capacity to acquire it that will independently review the government’s carbon budgets and plans to achieve them. For example, the UK’s Climate Change Committee reports that the UK government is on track to meet its second and third carbon budgets, but will not, without more effort, achieve the fourth carbon budget (for 2023-27). Just as each government agency engages in financial planning, a carbon budget approach requires that each government agency examine how many emissions the sector that they regulate will contribute to the carbon budget. The carbon budgets and plans need to be considered in all key government decisions. For example, a true climate change accountability law would ensure that no liquefied natural gas (LNG) plant – or other major GHG emitting project – would be approved until it is clear how the additional emissions would fit within the province’s future carbon budgets. Government policies should be evaluated against their impacts on the carbon budget. A target or plan that gets ignored when key decisions are made is not worth very much. The government and the independent scientific body need to regularly report back to the public on the government’s plans, implementation and progress to meeting the carbon budgets. We’ll keep pressing the BC government for a real climate change accountability act, one that leads to real climate action. BC climate leadership was once described as “the best climate policy in the world” – let’s keep that leadership alive.